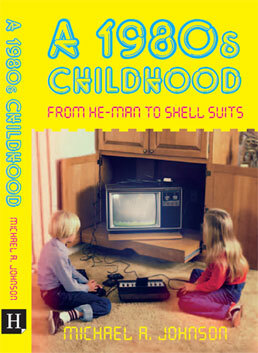 I can't tell you how I excited I am to announce that my new book "A 1980s Childhood" is in the final stages of production and is scheduled for publication in just a few weeks time! The book takes a humorous look at every aspect of 1980s life the way I saw it as a child. I'm sure it'll ring plenty of bells with anyone else who was around back then. As soon as I know the publication date, I'll be sure to let you all know so you can rush out and buy a copy (or two)! Do you remember trying to solve the Rubik’s cube whilst dressed in your He-Man picture pyjamas? Did you try to make ‘cool’ sound effects with your mouth like Jones from Police Academy? Or maybe you sang along to ‘Pass the Dutchie’ by Musical Youth in a fake Jamaican accent? If that sounds like you, there’s no mistaking you were a child of the eighties. Rev up your DeLorean, switch on the Flux Capacitor and take a cruise back through the decade that made you the person you are today. This amusing and entertaining slice of eighties life will jog the memories of all who grew up in the same decade where greed was good, mullets were cool and white dog poo littered the streets. Michael Johnson is curator of the popular eighties memorabilia website www.DoYouRemember.co.uk and can occasionally be heard on BBC Radio as guest eighties expert. Michael also runs website design agency www.FreshleafMedia.co.uk and lives in Dorset with his wife and two daughters. Wow congratulations, how very exciting for you. It looks like it's going to be a great read! Looks good. I've pre ordered a copy on amazon. what a great book mr remember.hehe. id love to buy this book but i will not be abe to as i do not and cannot buy from places like amazon etc as i have no credit card debit card etc. this is a book id dream of having as i love the eighties and was the decade i grew up in as a kid. only way i could do it is if someone like yourself could send me the book and ill send u cash special delivery. that definitely deserves a place on the book shelf ............is there one for the 70's? There is but it's not by the same author.